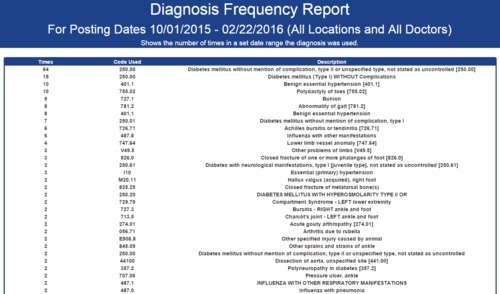 The Diagnosis Frequency report is an Advanced Report that shows the number of times in a set date range a diagnosis was used. Times — The number of times a diagnoses code was used during the selected date range. Code Used — The code that was used. This will display either the ICD-9 or ICD-10 code depending on frequency of use. Description — The description of the code.